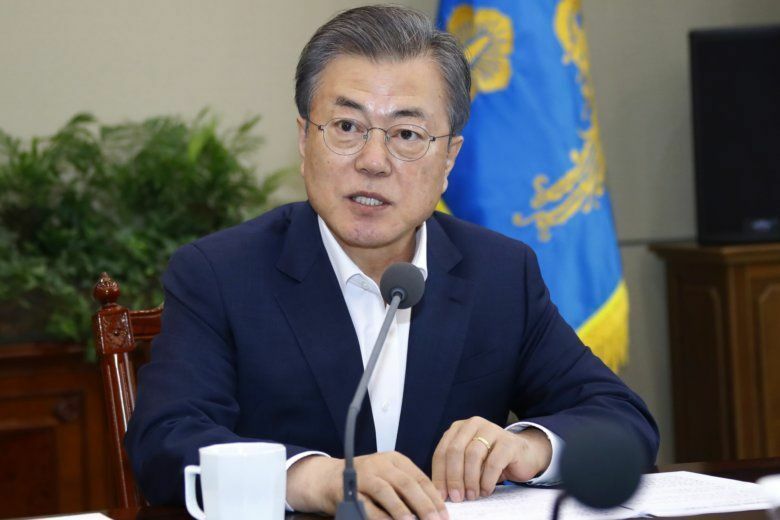 SEOUL, South Korea (AP) — South Korean President Moon Jae-in said Monday he’s ready for a fourth summit with North Korean leader Kim Jong Un to help salvage faltering nuclear negotiations between the North and the United States. It’s difficult for Moon to make further progress on inter-Korean engagement without some level of sanctions relief, which Washington says won’t come until unless Kim commits to verifiably relinquishing his nuclear facilities, weapons and missiles. Kim has shown no signs that he’s willing to give away an arsenal he may see as his strongest guarantee of survival, and Pyongyang apparently has been trying to drive a wedge between Washington and Seoul by appealing to Moon’s enthusiasm for engagement. “Whenever North Korea is ready, we hope that the South and North could sit down together and hold concrete and practical discussions on ways to achieve progress that goes beyond what was accomplished in the two summits between North Korea and the United States,” Moon said in a meeting with senior aides. Moon’s office did not provide a timeline on when his fourth summit with Kim might take place. Moon met with Trump last week in Washington, where they agreed on the importance of nuclear talks with North Korea but did not announce a specific plan to get the stalemated negotiations back on track. Moon spent the past year making aggressive efforts to stabilize South Korea’s hard-won detente with North Korea and improve bilateral relations. He also lobbied hard to set up the first summit between Kim and Trump last June, when they agreed to a vague statement about a nuclear-free Korean Peninsula without describing how or when it would occur. Moon has said it is Seoul’s “outmost priority” to prevent nuclear negotiations between the U.S. and North Korea from derailing, and there is speculation that he will soon announce a plan to send a special envoy to Pyongyang, North Korea’s capital, in an effort to rescue the talks. North Korea in recent weeks has been registering displeasure with Seoul, withdrawing its entire staff from a front-line liaison office with South Korea before sending some of them back, and refusing to show up for a previously planned joint search for war remains at the countries’ border. North Korea had been urging the South to break away from Washington and proceed with inter-Korean economic projects that are currently held back by sanctions. In a speech delivered to North Korea’s rubber-stamp parliament on Friday, Kim said he is open to a third summit with Trump but set an end-of-year deadline for Washington to offer mutually acceptable terms for an agreement. Kim also accused South Korea of deferring to the “anachronistic arrogance and hostile policy” of the United States and berated the ongoing military exercises between the allies. Although they described the exercises as defensive in nature, the United States and South Korea have downsized the drills to create a space for diplomacy with North Korea, which sees them as invasion rehearsals.